The IGS facility utilises its ground-breaking, patented power and communications technologies to address the key challenges facing the indoor farming industry. Fundamental barriers of cost of power and labour have inhibited the sector’s expansion to date, as well as the inability to produce consistent and quality produce at scale. The technology has been designed to overcome these barriers and significantly lower the cost of production overall. With global market growth predicted at 24 per cent over the next three years, opportunities are substantial, with over 95 per cent of its technology solutions expected to be exported. The farm will not be producing crops for sale, but IGS will be collaborating with growers, retailers and international organisations to deliver the hardware and software platforms to revolutionise indoor growing environments. David Farquhar, CEO of IGS, said: “The opportunity to unveil Scotland’s first vertical farm, and arguably the world’s most technically advanced indoor facility, is a hugely exciting one for the whole team. As a Scottish-founded and led team we have captured horticultural, engineering and software skills from within Scotland to make this business flourish. The location of the new facility at the James Hutton Institute near Dundee was deliberately chosen to enhance collaboration opportunities. Scientists and researchers at the Institute will be working with IGS to better understand how growing under lights can impact different varieties of crop growth, as well as drive increased productivity. Professor Colin Campbell, Chief Executive of the James Hutton Institute, commented: “There have been fantastic synergies oming out of the combination of the IGS technologies and Hutton’s cutting-edge plant science and collaboration. There are genuine potential game-changing opportunities both for new and conventional horticultural and agricultural systems that can come from our collaboration. “The fact that Scottish innovation and Scottish science have again led the world with something that has massive economic potential locally, as well as globally, with benefits for the environment due to more efficient energy, water and nutrient use is hugely exciting. 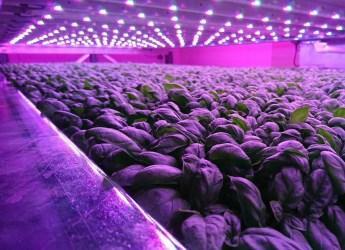 Intelligent Growth Solutions was established in 2013 as an indoor horticulture business with a vision to deliver commercial viability to the vertical farming model by improving productivity - yield, quality and consistency - whilst dramatically driving down the cost of power and labour through Total Controlled Environment Agriculture (TCEA). The Scottish-led IGS team have developed, patented and productised a breakthrough, IOT-enabled power and communications platform consisting of patented electrical, electronic and mechanical technologies. All this is managed by a SaaS & data platform using AI to deliver economic and operational benefits to indoor growing environments across the globe. This technical solution enables the reduction of energy usage by 50 per cent and labour costs by 80 per cent when compared with other indoor growing environments. It also can produce yields of up to 200 per cent more than that of a traditional greenhouse. Kate Forster, Head of Marketing, Intelligent Growth Solutions, Tel: +44 (0) 7787 534999, or Bernardo Rodriguez-Salcedo, Media Manager, James Hutton Institute, Tel: +44 (0)1224 395089 (direct line), +44 (0)344 928 5428 (switchboard) or +44 (0)7791 193918 (mobile).